Let me start by thanking all the USDA Accredited Certifiers who continued to certify and oversee organic farms and businesses and advance enforcement activities while we were out. This is a great example of how the National Organic Program (NOP) public-private partnership model works well for American consumers and producers. The National Organic Standards Board (NOSB) Spring Meeting will happen in Seattle, April 24-26, as scheduled. We are collaborating with the Board to set the meeting agenda. You can find details on the NOP website. We are looking at options for conducting certifier training events that were impacted by the shutdown. Thanks to the Accredited Certifiers Association (ACA) team for helping us provide a remote presentation and Q&A for about 150 attendees at the ACA training in Greenville, South Carolina this week! I am also speaking at the Global Organic Produce Expo (GOPEX) today in Florida. In case you missed it, on December 27, USDA published a final rule amending the National List of Allowed and Prohibited Substances for crops, livestock and processing. 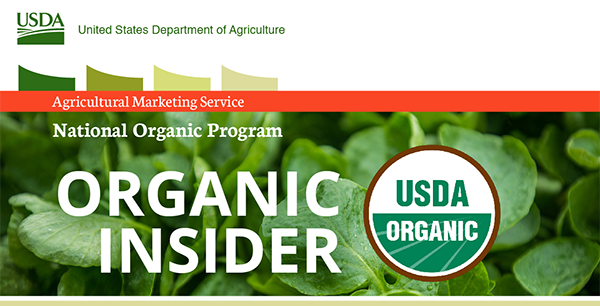 These 35 changes reflect National Organic Standards Board recommendations and the organic sector’s needs for additional tools or information to manage their agricultural or processing operations in compliance with the USDA organic regulations. The final rule successfully resolves many outstanding NOSB recommendations. Thanks to the many who have reached out and expressed support this week. We are glad to be back and ask for your patience as we get operations back up to speed. Organic Integrity from Farm to Table. Consumers Trust the Organic Label.